For many years the importance of wild plants in subsistence agriculture in the developing world as a food supplement and as a means of survival during times of drought and famine has been overlooked. Generally, the consumption of such so-called ‘wild-food’ has been and still is being under-estimated. This may very well be the case for Ethiopia, a so-called ‘biodiversity hot-spot’ and known as a centre of origin for a significant number of food plants (Bell, 1995). Rural people of Ethiopia are endowed with a deep knowledge concerning the use of wild plants. This is particularly true for the use of medicinal plants (Abebe and Ayehu, 1993) but also for wild plants some of which are consumed at times of drought, war and other hardship. Elders and other knowledgeable community members are the key sources or ‘reservoirs’ of plant lore. Wild-food consumption is still very common in rural areas of Ethiopia, particularly with children. Among the most common wild plant fruits consumed by children are, for example, fruits from Ficus spp, Carissa edulis and Rosa abyssinica plant species. The consumption of wild plants seems more common and widespread in food insecure areas where a wide range of species are consumed. The linkage has given rise to the notion of ‘famine-foods’, plants consumed only at times of food stress and therefore an indicator of famine conditions. Local people know about the importance and the contribution of wild plants to their daily diet as well as being aware of possible health hazards such as stomach irritation occasionally occurring after consumption of certain wild plants. In parts of Southern Ethiopia the consumption of wild-food plants seems to be one of the important local survival strategies and appears to have intensified due to the repeated climatic shocks hampering agricultural production and leading to food shortages. Increased consumption of wild-foods enables people to cope better with erratic, untimely rains and drought for several consecutive years without facing severe food shortages, famine and general asset depletion as in other areas of Ethiopia (see also Mathys, 2000). The key to this strategy for survival is the collection and consumption of wild plants in uncultivated lowland areas such as bush, forest and pastoral land as well as the domestication of a great variety of these indigenous plants and trees for home consumption and medicinal use in the more densely populated and intensively used mid- and highlands. Southern Ethiopia, particularly Konso, Derashe and Burji special weredas and parts of SNNPR (Southern Nations, Nationalities & People’s Region) may still be considered part of these so-called biodiversity hot-spots in Ethiopia. Konso people, for example, still have and use a well-developed knowledge concerning which wild-food plants can best provide a dietary supplement in periods of food shortage. Konso people, well known for their hard labour and sophisticated agricultural system (Lemessa, 1999b), have been stricken by drought since 1996. In this period they have faced repeated significant harvest losses and even complete crop failures. Nevertheless, until June 1999, most Konso people managed to cope with these harsh climatic conditions and survived by increasing their consumption of wild-food plants. Damaged, reduced or even lost crop harvests have been partly compensated by the collection of wild-foods. Unfortunately, three severe years with only meagre harvests and yet another harvest failure in 1999, was just too much for many people in Konso, an ecologically fragile area, despite the people’s incredible efforts to protect and conserve the local environment. The reasons to initiate a study on ‘wild-food’ plants, with an emphasis on ‘famine-food’ plants by the United Nations Emergencies Unit for Ethiopia (UN-EUE) have a largely practical and pragmatic basis. The initial idea was to document indigenous knowledge on wild-foods and, more particularly, on ‘famine-food’, to identify and understand better the importance of wild-food plants in the livelihood survival strategies adopted by rural people in food insecure areas of the country. In addition to this introductory article, a provisional field guide is being compiled which will include the most important wild-food and famine-food plants identified and collected. The guide will aim to facilitate plant identification and enable field officers to make comparisons across different areas in Ethiopia where people may have different eating habits and knowledge of wild-food plants. The guide will also be configured and kept as a data base at the UN-EUE office in Addis Ababa to be updated continuously, published periodically and distributed to interested parties within the research, development and humanitarian community. For each plant, besides its general physical description, specific information on consumption, palatability and preparation will be documented. A sample page describing on such wild-food plant taken from the field guide is annexed to this article. UN-EUE would like to encourage active contributions such as samples of additional wild-food plants for inclusion in the field guide and is hoping to obtain feed back on this article from interested parties1. Konso Special Wereda, Kindo Koyisha, Humbo, Damot Weyde and Kamba weredas of North Omo Zone and Bako-Gazar and Hamer Bena weredas of South Omo Zone in SNNP Region of Ethiopia were selected for the initial field survey because these localities figure among the chronic food insecure areas, periodically facing food shortages due to their fragile environmental setting. They are located 400 to 700 kms south of Addis Ababa (see annexed map). Besides the collection of secondary data, of which unfortunately very little exists on wild-foods and related subjects concerning Ethiopia, informal guideline interviews were conducted with selected key informants. Furthermore, extended field visits, bush and farm walks were undertaken for tracking down the specific plants. The study team was guided by local agricultural experts from wereda agricultural offices who identified knowledgeable key informants and also acted as translators. Besides general background information on comestible wild plants presented in this article, vernacular names of the plants were registered, photographs taken of each plant and, whenever possible, sample of the plants edible components taken, to be part of the anticipated field guide. Furthermore, sixty different plant specimens were collected, mounted, labelled and submitted to the National Herbarium at Addis Ababa University for identification and taxonomic classification of the species collected. The term ‘wild-food’, though commonly used, is misleading because it implies the absence of human influence and management. In reality, there is a continuum resulting from the development of co-evolutionary relationships between humans and their environment (Bell, 1995). People have indirectly shaped many of the plants and some have been largely domesticated in home gardens and in the fields together with farmers’ cultivated food and cash crops. Nevertheless, the term ‘wild-food’ is used in this article to describe all plant resources, which are harvested or collected for the purpose of human consumption outside agricultural areas in forests, savannah and other bush land areas. Wild-foods are incorporated into the normal livelihood strategies of many rural people, be they pastoralists, shifting cultivators, continuous croppers or hunter-gatherers (Bell, 1995). Wild-food is usually considered as an additional diet to farmers’ daily food consumption pattern, generally based on their crop harvest, domestic livestock products and food purchases on local markets. Fruits and berries from a wide range of wild growing plants are typically referred to as ‘wild-food’. Wild fruits and berries add crucial vitamins to the normally vitamin deficient Ethiopian cereal diet, particularly for children. The current case study in the Southern part of Ethiopia revealed that typical ‘famine-food’ consists of a variety of plants of which leafy and tender parts of stalks, pseudostems, fruits, berries, seeds, husks and roots, i.e. tubers and corms are mainly used for consumption. Plants classified as typical ‘famine-food’ plants are normally not consumed due to their limited seasonal availability, local taboos, offensive nature of the plants such as abundance of thorns and tiny spines (mostly not on the edible part of the plant), certain unpleasant characteristics and side-effects such as bad taste, complicated and prolonged preparation, and association with stomach complaints, constipation, diarrhoea and even intoxication. On the other hand, certain ‘wild-foods’ which are liked and therefore collected and consumed every time when ripe, may also become very important ‘famine-foods’ during periods of food shortage. In certain areas of Southern Ethiopia some potential ‘famine-food’ is well known as livestock fodder during normal times which will also be consumed by humans at times of severe food shortages. Depending on the parts of the plants (fruits, leaves, roots etc.) consumed in certain circumstances (normal time versus period of severe food shortage) by different consumers (adults, children, women, men), it is proposed for the purpose of the current study to distinguish four major categories of ‘wild-food’ plants: (1) typical ‘famine-food’ plants, (2) ‘wild-food’ plants with ‘famine-food’ components, (3) ‘wild-food’ plants attracting additional consumer categories during food shortage periods, and (4) on-farm food crops with ‘famine-food’ components. Each category and some typical representative examples of ‘wild-food’ plants are described below. From a typical famine-food plant leaves, stalks, stolons, inflorescence, roots (tubers and corms and rhizomes) or barks (mainly of Acacia sp.) are edible. Many of the root-type famine-food plants are drought tolerant and can stay in the soil intact for a long time. Therefore, they can be collected when the need is greatest. Most of the leafy-type famine-food plants are locally referred to and classified as ‘weeds’, sprouting and flourishing after rains. They generally mature within a short period of time (about two weeks). There are two main periods of maximum consumption of the leaves and tender parts of such famine-food plants. The first is while farmers are waiting for the upcoming crop harvest and, the second (main period), is when they run out of food stocks from the previous harvest, and are hence facing a food shortage. People try, whenever possible, to add famine-food to local staple foods or to mix it with other foodstuff to mask the often offensive nature of the food and to reduce any characteristic and unpleasant side-effects. During the field visit about 30 wild-food plant species were classified as typical famine-food plants from a total of more than 80 identified and listed wild-food species2. In the study areas of Southern Ethiopia, Arisaema sp (‘bagana’ in Konso language) and Huernia sp (‘baqibaqa’) are considered to be typical famine-food plants. Bagana is a corm plant of which three varieties are used: the normal bagana, the litota (some call it also ‘panshala’) and the Romitta variety. All are growing in farm fields. The litota variety (Arisaema flavum) is preferred to the other two because it has a relatively acceptable taste. Compared to normal bagana and the Romitta variety, it can be prepared within short time and is furthermore less perishable, hence can be stored for a longer period of time. But all three varieties have to be crushed and dried prior to further preparation. The dried parts are then ground to powder. Finally the powder is mixed with water and cooked like maize for approximately 30 minutes. The process may take several days of preparation before the other two bagana varieties can be consumed. Baqibaqa is a small stick-like drought tolerant plant "without leaves" of plastic-like constitution, propagating vegetatively by cuttings. In Konso, farmers differentiate three varieties of baqibaqa for which they have no specific names. The first variety is of brown colour and reaches up to 25cm in length, the second is green and slightly longer, the third is grey, short and thick (approx. 10cm). Farmers explained that baqibaqa tastes relatively good without unpleasant side-effects when boiled and consumed. In Konso it is mostly eaten together with kurkufa (in Konso language), locally prepared sorghum balls. 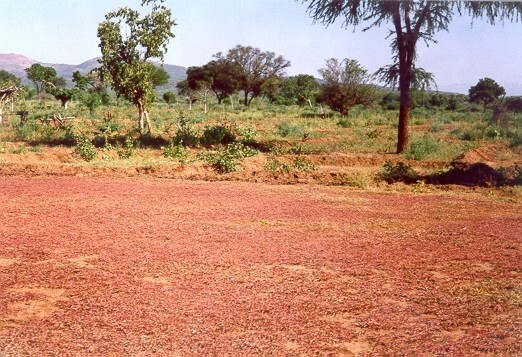 Other examples of typical famine-food plants in Konso are Sterculia africana (‘qawureta’ in Konso language), Dobera glabra (‘karsata’ in Konso language), Portulaca quadrifolia (‘marayita’ in Konso language) and Cadaba sp (‘kadhi’ in Konso language). Within this category so-called multi-purpose wild-food plants are represented. Fruits plus one or more additional food products such as leaves and tender parts of stalks and/or root parts can be used at different times of the year and at different stages of food shortage. The study could only identify three species fitting into this multipurpose ‘wild-food’ plant category. Balanites aegyptiaca (‘bedena’ in Amharic), a small evergreen tree, about 10 to 20 meters of height, is a typical representative of this category. Its fruits are eaten any time when ripe by children and in food shortage periods also by adults. The new shoots, which are always growing during the dry season, are commonly used as animal forage. But in periods of food shortage people cut the newly growing succulent shoots and leaves and cook them like cabbage. People in drought prone areas of southern Ethiopia also apply these consumption habits to the fruits and young leaves of Solanium nigrum (black nightshade), a small annual herb and Syzygium guineense (waterberry tree), a dense, leafy forest tree around 20 meters in height. The majority of wild-food species encountered during the field study in southern Ethiopia could be classified into this category. For all the species classified in this category people’s consumption behaviour is the same, that is, only the fruits or the berries are eaten or considered edible. Children consume the fruits in normal times, but when food is short, adults as an additional consumer category, will collect and consume fruits from wild trees. From a total of more than 80 identified and listed wild-food species, fruits are exclusively consumed from 38 of them, which are mostly tree and bush species such as a variety of identified Ficus species. On-farm crops with famine-food components are few and are likely to be perennial plants. The famine-food components are normally not consumed because it may imply the total destruction of the plant. Farmers consulted in the different study areas mentioned five on-farm crops bearing famine-food components: banana (Musa paradisica), false banana (Ensete ventricosum), cotton plants (Gossypium spp.) and sorghum (Sorghum spp). In Wolayta, North Omo Zone, the corm (root and stem juncture) and fleshy pseudostem (false-stem) of the banana plant is consumed when severe food shortages occur. At times of hardship immature enset plants are also harvested and used in a similar way. As the corm and the pseudostem are decorticated, the banana and enset plants have to be destroyed. Enset, commonly found in every home garden of the surveyed areas in North Omo Zone, reaches maturity after about eight years depending on the type of clones planted and the local agro-ecology. But many farmers are forced to harvest and destroy the plant before it reaches physiological maturity, which consequently leads not only to the total destruction of the crop but also affects the quality and quantity of the food products obtained. Sometimes, when there is an acute shortage of food, farmers may even consume seedlings and saplings of enset (Shank et al, 1996). In Konso, school children revealed the consumption of unripe boiled papaya (Carica papaya) fruits mixed with moringa (Moringa oleifera) leaves during the 1999 famine period in the wereda (DPPC, 1999b). In southern Ethiopia, cotton as a cash crop is very popular among farmers. Cotton seeds are edible and if available, consumed during periods of food shortage. In Konso, cotton seeds are boiled and eaten mixed with other foodstuffs. During times of severe food shortages, farmers in Konso revealed the consumption of sorghum husk mixed with other foodstuff such as cereals obtained through humanitarian relief food distributions (personal observations). The lowland savannah of southern Ethiopia is among the remaining and most important niche for many kinds of indigenous plant species, notably wild-food plants. This is partly because these areas are less impacted by the activities of people, typically sedentary cultivation and permanent settlements. Most of the wild-food species identified during the course of the present study were collected from the lowland areas. Many, particularly trees and shrubs, are only found there. Nowadays, people collecting and using wild-food have to travel ever further from their villages in the mid- and highlands because more and more bush land is being destroyed and turned into arable land for cultivation. Wildfire, deliberate burning - mostly to get pasture grasses regenerated and control animal exo-parasites like ticks, deforestation and bush clearing are major threats to the biodiversity of this unique ecosystem. Many useful indigenous plant species are gradually disappearing, being the unfortunate victims of deforestation and the general destruction of land and trees. In southern Ethiopia, particularly in Konso, charcoal production was unknown until some two years ago (until 1998). Road construction workers, who use charcoal for cooking, are disseminating the skill of charcoal production. The construction of the new road from Konso to Burji Special Wereda brought charcoal production to the area. New roads also opened-up new market opportunities and charcoal, being mainly used in urban households, is a welcomed off-farm income opportunity. But charcoal production is, no less than wildfire, an efficient and evil tree killer. In places where charcoal production relies on open bush land and natural forests, indigenous trees are rapidly and irreversibly disappearing. The annexed map shows the parts of southern Ethiopia where most of today’s indigenous wild-food species are available. The map indicates the places where samples of wild-food plants were collected during the survey. The history of settlement in most parts of Ethiopia tells us that people first populated the highland areas for security and protection and the more favourable climate. The lowlands, on the other hand, were avoided as much as possible mainly due to the threat of malaria. Today, land is short due to the high population density in most highland areas of Ethiopia. High population density has led to environmental degradation and many highland areas have lost their once rich and unique biodiversity. Regarding trees and shrubs, indigenous species have largely been replaced by a few fast growing exotic species, notably eucalyptus. This exotic tree, introduced to Ethiopia at the end of the last century, became important for farmers as a cash crop, for construction and as a source of energy, but eucalyptus cannot provide the same wide variety of different products as indigenous species. On the other hand, declining biodiversity and the dependence on a narrow range of crops for food production, increases vulnerability to food shortage. Using improved and hybrid varieties, which have been bred for specific characterisitics and minimal variability (as opposed to the landraces) with higher yield potential has also increased the vulnerability of some communities to food insecurity as they lack drought, pest and disease tolerance and are poorly adapted for long-term storage, unless chemically treated. These problems are further compounded by the lack of market facilities and the existing infrastructure problems in the country. In Ethiopia, with its extreme local variations in ecological, climatic, soil and farming characteristics, the use of "improved" crops showing minimal genetic variability (uniform crop varieties) does not help much, unless complemented with local crop varieties and landraces. Striking the balance between the two will help to bring the required food security improvement. The decline in biodiversity as observed in Welo and North Shewa in the northern part of Ethiopia, is a potential threat to food production, as crops become more vulnerable to pest attacks, diseases and dry spells (Guinand, 1999). Where forests and bush lands are cleared for cultivation, the rich indigenous biodiversity is gradually disappearing and recognizing the value of certain wild plants farmers have managed, to a certain extent, to preserve some of the more important indigenous species by either domesticating them on their farm plots, home gardens or by preserving and managing them in situ. In southern Ethiopia, some wild-food plants considered as typical famine-foods, i.e. Arisaema sp and Huernia sp are purposely cultivated on farm fields to be available and used at times of food shortage. Huernia sp is cultivated on the stone walls forming the terraces in the midlands (weyna dega) of Konso Special Wereda. By having chosen this particular niche, Huernia sp does not compete with other crops. Arisaema sp is commonly present in farm fields like many other famine-food plants, which usually are considered weeds. Therefore, farmers uproot and destroy them during normal cropping seasons. But when rains fail and the crop harvest is endangered, these weeds, the famine-food plants, become an important food resource. 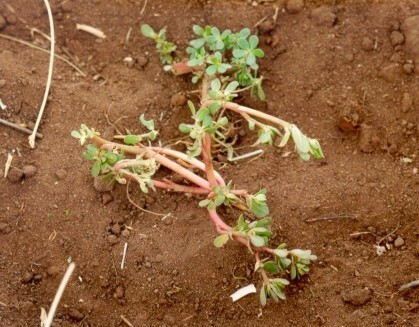 One of the most common and well-known typical famine-food plants in southern Ethiopia is Portulaca quadrifolia, which was mentioned in all the surveyed areas as one of the most important species. Unfortunately, it is a noxious weed infesting farmlands and difficult to control and eradicate once established in a field. Even though considered a crucial famine-food plant, the species can neither tolerated nor domesticated on-farm due to its aggressive behaviour. Most useful indigenous wild-food herbs and tree species found on farmers' fields have not been purposely grown and domesticated in the proper sense. Some of them, like Amaranthus sp and Solanium khasianum, are mostly wildlings, which germinated in home gardens and farmlands and are usually not given much attention. But they are consumed at any time like any other cultivated crop. These two plants are used and have the potential for becoming useful staple crops and it is unclear why these two plants are not given appropriate care and management. Farmers know how to make use of indigenous tree species, but they have little knowledge about seed treatment and other propagation methods. Most of the indigenous trees are not planted and raised purposely. But farmers know about the usefulness of certain tree species. So, if it happens that a seedling, a so-called wildling, germinates and grows somewhere on the farm, it will be nurtured and protected. Wild-food plants are able to fill a variety of food gaps. If, for example, the previous crop harvest was not able to provide enough food to last through to the next harvest, wild leafy vegetables, cabbage and tuber-type famine-food plants will be consumed to fill the gap after the first rains, when farmers are preparing their fields. These typical famine-food plants grow fast after the first rain showers and can be consumed shortly after. Wild tree fruits usually mature only once a year, mostly coinciding with the growth cycle of cereal food crops. Therefore, in a situation where a dry spell exacerbates serious crop losses or even complete harvest failure, wild fruits will help fill the immediate food gap after a failed harvest. Nevertheless, in most of the areas surveyed it was observed that different wild fruits are available at most times of the year. The current survey took place in January this year and the last cultivated crop was harvested in November last year, and yet the fruits of many identified wild-food species were ready to be tasted. Others were on the verge of maturity, while some others were not available at all. Contrary to previous assumptions, the study team learned that people have the opportunity to collect wild-food almost throughout the year. But in most cases the biomass production from the famine-food plants is not bulky enough to cover the required needs. For example, in Konso there are three fruiting periods depending on the tree species. The main fruiting periods for most of the tree species are from May to June and from October to November. But farmers reported that Balanites aegyptiaca, and Balanites rotunda trees give fruits in December and January. Fruits from wild plants are usually consumed raw as they are picked. Leaves and other tender parts of wild plants are prepared like cabbage and other vegetables, i.e. chopped into small pieces and boiled in water. Roots are either eaten raw or cooked. Some wild tubers are first dried and then crushed. Root parts are usually more complicated and need a longer preparation time and process, especially those which are toxic and need special treatment. Kernels, seeds and nuts are also mostly cooked for a fairly long time before consumption. The consumers revealed that, whenever possible, they need to use more salt to mask the distasteful feature of the foodstuff prepared. Unpleasant side-effects such as bad taste, complicated and long preparation, stomach aches, constipation, diarrhoea and even intoxication are mostly observed with typical famine-food plants. For example the fruits of Dobera glabra, the Konso people’s drought indicator plant, are edible and the kernel is considered a typical famine-food. It has to be cooked for a long time, i.e. up to 24 hours, and it produces a bad smell. According to farmers interviewed for the study, excessive consumption causes stomach aches and other intestinal problems. In some cases, local consumption variations for the same species have been observed. For instance, Konso people eat only the fruits of Balanites rotunda, a small evergreen tree. But in Kamba Wereda of North Omo Zone, the whole fruit is boiled, the skin removed and the flesh eaten off the kernel in times of food shortage. The kernel is then broken and the inner parts eaten. Piliostigma thonningii (‘olofo’ in Hamer language) trees are another example. In Alduba village (South Omo Zone) the Hamer people collect pods of the tree and eat the fleshy part around the small seeds like biscuits, whereas in Bedessa and Kindo Koyisha weredas of Walayita, the same part of the tree is commonly used as animal forage but not for human consumption. This discrepancy in knowledge regarding the uses and edibility of parts of the same species may have to do with the frequency of food shortages in a specific area and/or people's way of life. In semi-arid areas, where basic resources such as food are scarce anyway, people may have been under pressure to adapt to the harsh conditions of life and discover a greater variety of edible wild plants and their respective parts. In highly populated areas where intensive cultivation is the norm, biodiversity is considerably reduced and the possibility of finding wild-food plants minimised compared to the lowland areas. Often wild-foods are considered to be a low-status food and its consumption regarded as a source of shame. In normal times only children, youngsters and the poorest families collect and consume regularly wild-food. In Kayissa Kebele, South Omo Zone, farmers interviewed stated that all the 10 wild-food plant species collected are not consumed by the majority of the population except when there is a serious shortage of food affecting all strata of the population from the poorest to the richest. But for the poorest, collection and consumption of wild-food may make up an important portion of their daily dietary intake. Not all people encountered were willing to provide information about wild-food and particularly famine-food. Some of the farmers were grinning when questioned, obviously feeling ashamed and maybe offended by the outsiders who ask questions about such sensitive issues as the consumption of famine-food. Unlike other many other African countries and especially many Southeast-Asian and Asian countries in general, Ethiopians do not consume animals like ducks, pigs, donkeys, horses, snakes, rabbits, rats, cats and dogs. Religion, particularly of the Christian Orthodox Church of Ethiopia, represents a major non-negligible constraint to the use and consumption of wild plants and animals. For the believers, the consumption of wild plants and animals does not conform to their system of traditional and religious beliefs. This means that the range of food available to people during times of stress is narrowed considerably despite Ethiopia’s rich biodiversity. As a matter of fact, wild animals as a research subject were excluded from this study. Therefore, we will not go further into detail concerning wild animals for food. Ethiopians generally are constrained to the consumption of the commonly cultivated crops and neglect wild plants like Amaranthus and Solanium khasianum which have clearly demonstrated their production potential in pocket areas of the country. These and other similar plants could have been fully domesticated and cultivated like any other food crop. Strong traditions, beliefs and religious taboos still obstruct people’s psychological and mental willingness to domesticate and cultivate wild-food plants. This is a reality that cannot be denied and has to be confronted if the full potential of the indigenous Ethiopian flora as a source of food is to be effectively exploited. In the southern part of Ethiopia, where there are many different tribes still living with their indigenous beliefs and traditions, there are fewer religious and external constraints than in other parts of the country. In the areas studied the daily diet of most people still comprises an element of wild-food, both animals and plants, during certain periods of the year. Mostly children collect and consume the fruits of wild plants. Other wild-food and famine-food plants are collected by children and women and prepared by the latter in all the areas surveyed. Women frequently collect wild-food when they are on their way to fetch water, to collect firewood, to go to the market and when walking home from their fields. Able-bodied male members of the community usually migrate for daily labour opportunities elsewhere during periods of food shortage. Women and children are left behind to manage as best they can. Therefore, women and children are the main actors concerning the collection, preparation and consumption of wild-food plants. Children forage and climb trees for collection while women do the preparation and the cooking. Young rural males consume more wild-foods than older ones in normal times. At times of food shortage, however, all ages and both sexes consume equally, not only to satisfy their need for additional sustenance but also for traditional fulfilment and for local curative treatments, like consumption of fruits of Embelia schimperi (‘enkoko’ in Amharic) against intestinal parasites. Despite Ethiopia’s long history of cyclical famines, civil war and ethnic feuding during which many people repeatedly endured hardship and deprivation and were forced to collect and consume wild plants to survive, little is known about these wild plants either within the Ethiopian nor within the international agricultural research community. Evidence was uncovered in the course of the present study that edible wild plants make a major contribution to dietary intake of rural people during times of food shortage. Hence, the consumption of wild plants is a necessary part of the strategies adopted by people in order to survive in a harsh and unforgiving environment. There is a need to document, describe and publish such information to enable specialised research institutions to carry out specific studies on a variety of issues concerning the prevalence and use of edible wild plants in Ethiopia. For example, little is known either about the nutritional value or possible undesirable side-effects such as toxicity of food originating from wild, non-domesticated plants. Therefore, it seems imperative to carry out applied research on the nutritional values of these plants and their potential impact on human health as a result of prolonged consumption. It is still as yet unclear if over time some of the wild-food plants have long-term positive or negative effects on the health of consumers. But as this informal field study has revealed, some of the wild plants used locally for consumption at times of food shortage, have the potential to become valuable staple foods and important alternatives to the usual food crops cultivated by farmers. National as well as international agricultural and food policy research institutions may become interested and may want to initiate further in-depth research regarding the potential for the domestication of some of the species used as sources of wild-food. Wild plant species, which farmers value highly and appreciate when it comes bridging a food gap, should be studied and their biophysical performance, if necessary, improved. Research may be undertaken to improve some of the potential wild plants’ palatability. The study team identified a number of useful indigenous food producing tree species which could easily be domesticated by farmers, if the proper propagation methods for different species of plant could be acquired and applied instead of farmers relying on the uncontrolled occurrence of wildlings. It has to be stressed, that where environmental degradation is accelerating such as in many highland areas of Ethiopia, germplasm collections of wild-food plants should be initiated before potentially valuable traits are lost for ever. This study gives indications that wild-food plants should be considered as a serious issue when it comes to developing strategies to fight rural food insecurity and develop integrated development programmes for chronic food insecure areas in Ethiopia as well as in other parts of the world. Relying to a greater degree on wild-food plants during periods of food shortage does not mean that wild-food plants are a substitute for cultivated staple food crops. They are rather a supplement. The promotion and propagation of wild-food plants, however, may be an alternative to modern and artificial ways of boosting food availability such as using gene-technology, for instance, to increase crop yields and enhance production. The option to improve food production through exploiting the potential of wild-food plants is a naturally sustainable, cheap and locally available alternative to resolving at least part of the food shortage problem. At the same time, an emphasis on the development of wild-food plants will help enhance and maintain biodiversity. Modern tropical agricultural research tends to rely too much on too few a number of varieties of staple crops which are being improved by highly advanced technologies, going as far as to change the genetic make-up of plants in order to improve their performance. Research is underway to genetically change the composition of rice to enable the production of vitamin A, a vitamin which is widely lacking among rice consuming populations, causing a number of serious diseases. Gene-technology may be one solution, but a very risky and costly one indeed. A possible alternative to addressing the vitamin A problem might be research on indigenous edible wild plants for their vitamin A content. Promising plant species and varieties may then be selected by careful screening and propagation and finally disseminated to farmers. Ethiopia is endowed with a wide range of agro-ecological zones and conditions. The current study included only parts of southern Ethiopia, one among many other potential areas where wild-food plants exist and are consumed. It is assumed, therefore, that there is much more additional information available from other parts of Ethiopia which should be recorded. The current study may therefore be extended to other parts of the country where there is a high level of food insecurity. As this article intends to raise awareness among interested parties for further in-depth research, it is hoped the issues discussed will be picked up by other research, development and humanitarian bodies such as national and international research and development institutions, which may be interested in initiating research and development activities regarding wild-food and famine-food plants. In this regard the present article may also be taken as a research idea or proposal. If you want to contribute directly to the field guide compendium, please refer to the annexed sample for the required information on each species and send, if possible, also two pictures of the species, a close-up and one which is showing the entire species. Contributions can either be sent by e-mail directly to the UN-EUE office; e-mail undp-eue@telecom.net.et or handed in or sent to UNDP-EUE, P.O. Box 60252, Addis Ababa. In Northern Ethiopia Grass Pea, also called Chickling Pea or ‘Vetch’ (Lathyrus sativus), known in Amharic as guaya, is known as typical famine-food plant. Grass Pea has been introduced to the northern highlands as a fodder species for livestock but the plant is consumed by humans during food shortage periods. Grass Pea is a drought tolerant, high yielding nitrogen rich leguminous crop with high-quality protein and carbohydrate. Consumed excessively, Grass Pea causes irreversible crippling effects, a disease known as lathyrism (Tekle-Haimanot, 1994). The consumption of Grass Pea in the highlands of northern Ethiopia and the continuous increase of cases of human lathyrism, has repeatedly been reported (Ahrens, 1997, 1998; Klingele, 1998; Getahun and Haimanot, 1998). This livestock fodder and famine-food crop is increasingly consumed in chronic food shortage areas. The disease occurring after excessive consumption affects particularly the poorest and most active population segment. Even though more commonly consumed in Ethiopia’s food insecure areas, typical famine-food plants are also being consumed by people who face food shortage in other areas of the country such as Jimma Zone of Oromia Region. Weeds like Sporobolus indicus (‘muryi/harata’ in Oromiffa), a grass weed with tiny seeds like teff grains, Guizotia scabra (‘hadaa’ in Oromiffa) and Bidens pachyloma (‘chuqii’ in Oromiffa), are considered typical famine-food plants and are being consumed by the 1999 food shortage victims in Seqa Choqorsa and Setema weredas (Lemessa, 1999c). The team would like to acknowledge farmers in the study areas who after being nagged for their life-long experiences, shared their unique knowledge of plant lore during the field research. Without them this study would have been impossible. Special thanks go to Ato Torayito Kussiya, Development Coordinator for Mekane Yesus Church in Konso who was very helpful and spared a lot of his precious time. We are also equally indebted to Ato Korra Gerra of the Konso Wereda Bureau of Agriculture. Ato Asefa Nana of SOS Sahel in Kindo Koyisha Wereda (Walayita) also needs to be thanked for his assistance in guiding the researchers. Finally, government staff from Kamba, Damot Woyide, Humbo, Bako-Gazer and Hamer-Bena weredas who happily assisted the team also deserve appreciation. List of useful reports, papers and previous UN-EUE mission reports Abebe D and Ayehu A (1993): Medicinal Plants and Enigmatic Health Practices of Northern Ethiopia. Monograph, Addis Ababa. Abegaz D and Demissew S (1998): Indigenous African useful plants: medicinal plants in Ethiopia, Kenya, Tanzania and Uganda. The United Nations University/The Institute for Natural Resources in Africa (UNU/INRA). Survey report presented at the regional workshop for African academics and scientists, 2 to 5 March, 1998, Accra. Ahrens J D (1997): Beneficiary numbers to be increased: Amhara Region after the failed Belg. UN-EUE Field Mission Report, 20 to 26 July, 1997, Addis Ababa. Ahrens J D (1998): South Welo expects a bad Belg season. UN-EUE Field Mission Report, 18 to 23 May, 1998, Addis Ababa. Bekele-Tesemma A, Birnie A, Tengnaes B (1993): Useful trees and shrubs for Ethiopia, identification, propagation and management for agricultural and pastoral communities. Regional Soil Conservation Unit/SIDA, RSCU, Nairobi. CSA (1998): The 1994 Population and Housing Census for Ethiopia, Results at Country Level, Central Statistical Authority, Volume I, Statistical Report, Addis Ababa. Dania Ogbe F M, Egharevba R K A, Bambidele J F (1998): Indigenous African useful plants in Edo and Delta States of Nigeria, The United Nations University/The Institute for Natural Resources in Africa (UNU/INRA). Survey report presented at the regional workshop for African academics and scientists, 2 to 5 March, 1998, Accra. DPPC (1999): South Omo Zone Food Situation Report, December 1999, Team Report from the National Harvest Assessment 1999, Addis Ababa. DPPC (1999): Relief Needs Assessment in Konso Special Wereda of SNNPRS. Team Report from the National Harvest Assessment 1999, 28 to 30 November, Addis Ababa. DPPC (1999): Harvest Zone Level Report Derashe Special Wereda, Team Report from the National Harvest Assessment 1999. 30 November, Addis Ababa. DPPC (1999): The 1999 Meher Crops and Needs Assessment, North Omo Zone, SNNPR. Team Report from the National Harvest Assessment 1999, 14 to 28 November, Addis Ababa. Farah A Y (1996): Preliminary Examination of Major Factors Affecting Subsistence Economy of South Omo Zone and Konso Special Wereda in Southwestern Ethiopia. UN-EUE Field Mission Report, 30 April to 7 May, 1996. Addis Ababa. Getahun A (1974): The Role of Wild Plants in the Native Diet in Ethiopia, in Agro-Ecosystems No 1, p. 45 — 56, Amsterdam. Getahun H and Haimanot R T (1998): Report on new Lathyrism epidemic in Ethiopia. Report submitted to WHO, Department of Internal Medicine, Addis Ababa University, Addis Ababa. Guinand Y F (1999): North and South Gonder — Food Security Assessment in Part of the Tekeze River Watershed. UN-EUE Assessment Report, 26 May to 7 June, 1999, Addis Ababa. Isoum M (1998): The extent of use of indigenous African food crops in South-eastern Nigeria. The United Nations University/The Institute for Natural Resources in Africa (UNU/INRA). Survey report presented at the regional workshop for African academics and scientists, 2 to 5 March, Accra. Kelecha W M (1976): A glossary of Ethiopian plant names. Ministry of Agriculture and Forestry, First Edition, Addis Ababa. Klingele R (1998): Looming Crisis in South Welo. UN-EUE Field Mission Report, 11 to 18 November, 1998, Addis Ababa. Lemessa D (1999a): Field Assessment Mission Report: Wolayita, North Omo Zone. UN-EUE Field Mission Report, 17 to 21 August, 1999, Addis Ababa. Lemessa D (1999b): Rapid Assessment Mission Report: Konso Special Woreda, SNNPR. UN-EUE Field Mission Report, 29 to 31 August, 1999, Addis Ababa. Lemessa D (1999c): Prosperity Fades: Jimma and Ilubabor Zones of Oromia Region. UN-EUE Field Mission Report, 5 to15 October, 1999, Addis Ababa. Mashingaidze K, Madakadze R M, Masarirambi M T (1998): Indigenous African food crops and useful plants in their preparation for food in Zimbabwe. The United Nations University/The Institute for Natural Resources in Africa (UNU/INRA), Survey report presented at the regional workshop for African academics and scientists, 2 to 5 March, 1998, Accra. Mayhs E (2000): Assessment of the impact of food aid on household economics of North Wollo, South Wollo and East Hararghe, Ethiopia. Food Security Unit, Save the Children (UK), Nairobi. Okafor J C (1998): Indigenous African useful plants in home gardens of West and Central Africa: coordination report. The United Nations University/The Institute for Natural Resources in Africa (UNU/INRA). Survey report presented at the regional workshop for African academics and scientists, 2 to 5 March, 1998, Accra. Parker B (1993): South Omo Field Trip Report. UN-EUE Field Mission Report, October 1993, Addis Ababa. Parker C (1992): Weeds of Bhutan. National Plant Protection Centre Simthoka, Royal Government of Bhutan, Department of Agriculture, Thimphu, Essen and Exeter. UNICEF, (1999): An Interagency Mission on non-food needs of the drought affected people in North Omo Zone and Konso Special Wereda. UNICEF Internal Field Mission Report, 17 to 24 June, 1999, Addis Ababa. Webb P and von Braun J (1994): Famine and Food Security in Ethiopia; Lessons for Africa. The International Food Policy Research Institute, Chichester. General description: An annual succulent herb (weed) with prostrate and many-branched stems forming a dense mat. Leaves are sessile, simple, small, thick, fleshy and red in color. They are arranged spirally or opposite. In fact, there are three different species (based on the color of their leaves and stems) in the visited areas. The plant is known as a noxious weed growing abundantly on farm fields, roadsides and wastelands covering the ground like a mat (see picture below). It is difficult to uproot by hand pulling as the plant tenaciously sticks to the ground and is easily cut in to pieces that could develop in to an intact plant. 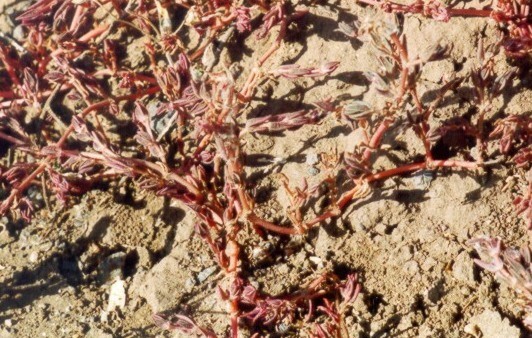 It is tolerant to desiccation and has a tendency to re-grow after uprooting. Edible part(s), preparation methods and palatability: Whole plant (leaves and stem) is collected, boiled and consumed in Konso. Nevertheless, in Bako-Gazar (Jinka) areas unlike in Konso, only leaves and tender parts of the stem are consumed and only in severe food shortage periods. It is also sold on market to generate some little income. Farmers reported that the plant is delicious but due to social status implications they are neglecting it in normal times. It is considered as a typical famine food. Agroecology: Usually grows in the lowlands particularly on disturbed/cultivated fields. Propagation method(s): vegetative propagation by cuttings. Remarks: Farmers complain that it is a difficult weed to control it in that a tiny cutting of the plant invades an area very shortly and because it grows even under moisture stress conditions.